The Ministry of Agricultural Development (MoAD) estimates total production of winter crops (wheat and barley) at 2.0 million mt, an increase of 10.86 percent compared to the preceding five-year average (the normal level)1 and 4.95 percent compared to the 2013/14 season. As in the 2013/14 season, the central region recorded the largest share of wheat production (32.6 percent of the total), with 644,063 mt of wheat produced. Dhanusha, Rupandehi, Kapilvastu, Bara and Kailali were the top five wheat-producing districts in 2014/15. Above-normal rainfall was reported during the growing season and is believed to have provided the optimum moisture requirement for the winter wheat crop, but the prolonged withdrawal towards the harvest period adversely affected the wheat and lentil harvest in some districts. 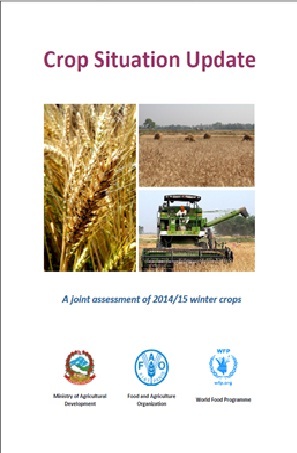 MoAD estimates the overall cereal production (summer and winter) for 2014/15 at 9.26 million mt, a decrease of 3.1 percent compared to last year (2013/14). Production of summer crops (paddy, maize, millet and buckwheat) was estimated at 7.2 million mt, an increase of 3.45 percent compared to the preceding five-year average and a decrease of 5.12 percent compared to 2013/14. At 7.2 million mt, production of paddy, maize, millet and buckwheat was estimated at 4.7 million mt, 2.1 million mt, 308,000 mt and 10,870 mt respectively. With 1.97 million mt of production, the eastern region has the largest share of summer crop production (27.24 percent) followed by the central region (27 percent).